Elegant without feeling too formal, this extra large TV stand with an electric fireplace features a breakfront design with bracket feet, stately center pilasters, and glass doors on each end. 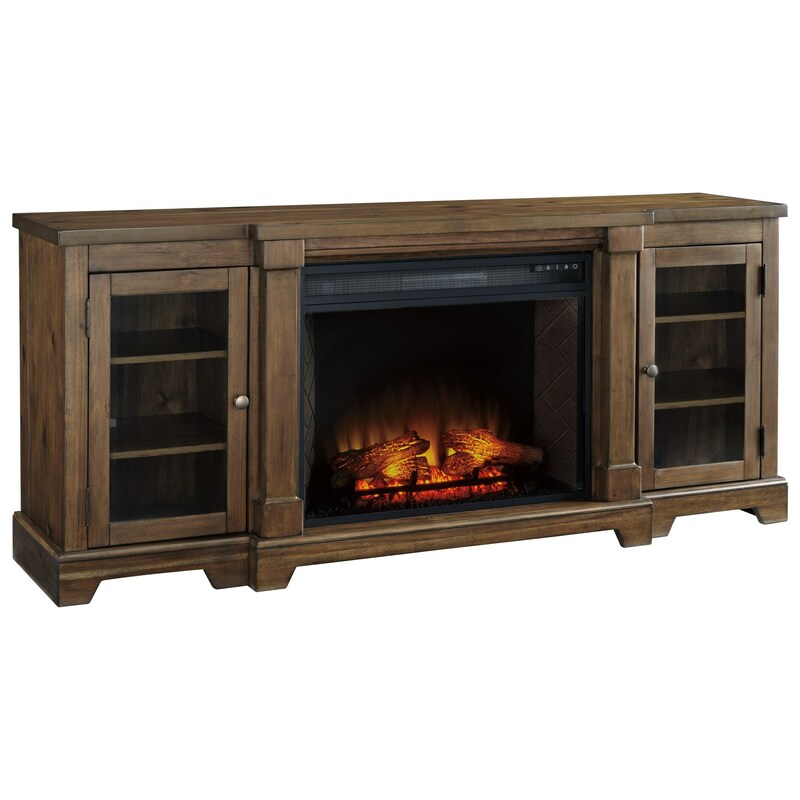 Designed to work with TVs up to 75", the TV stand is made with select hardwood solids and acacia veneers in a medium chestnut brown finish that shows of the natural beauty of the wood grain.The TV stand set includes a large fireplace insert with infrared heating element for ambiance and comfort. The fireplace insert is a 26” wide unit with LED lit fire display, remote control; herringbone firebrick surround, realistic log set, and ambient down lighting. It features five levels of flame brightness settings. The Flynnter Breakfront Extra Large TV Stand with Fireplace Insert by Signature Design by Ashley at Miskelly Furniture in the Jackson, Pearl, Madison, Ridgeland, Flowood Mississippi area. Product availability may vary. Contact us for the most current availability on this product. Storage Side door opening (2) 14.00" x 13.50" x 23.88". Adjustable side shelf (4) 16.00" x 13.13" x 0.63". Center opening 30.25" x 14.25" x 24.00".